This past weekend we had some water issues in the basement (the unfinished, non-Byte Cellar part of the basement) tied to our A/C unit. In hunting down the problem, I had to displace many of the boxes in which my retro treasures came to me. And, after the issue was all patched up, I was forced to again evaluate my stance on saving these cardboard vessels of years past from which hatched so much vintage computing goodness. Most retro computer collectors value the inclusion of the original box in any acquisition, and I’m no different. But, the problem is, once the hardware inside is removed and properly set up, the boxes simply section off valuable spaces of air in my basement. And I’ve decided I just can’t afford that in my tiny basement storage areas. So, I let almost all of them go. This entry was posted in Just Rambling, Multi-Platform. Bookmark the permalink. Shame – couldn’t you fold them down and keep them? I would’ve carefully cut them open where they were glued or stapled and just folded them all up, or just put them up on e-Bay – people will always pay for boxes like these if they’re in good condition. On the extreme end, it’s a severe mental health issue that you can address as a business of health care or science writer. Look into the treatment demand for clinically diagnosed compulsive hoarding – disposohobia – and whether more people are seeking help due to the disorder’s higher visibility in recent years? Check with local counseling centers, therapist and psychiatrists for an interesting business of health angle. I personally couldn’t see anything wrong with that image, there’s a healthy number of Apple and Atari products in there, and not too many Commodore things. File me as another reader disappointed you didn’t just fold them down, and/or sell them on e-bay once folded. 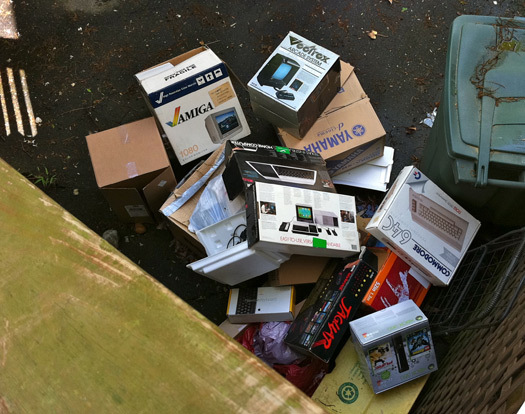 And this is why I’ve stopped buying boxed retro hardware. I don’t believe I’d be able to simply let such well-preserved boxes go. Terrible! Being in its original box in good condition enhances the machine’s potential resale value in the future.